FCI not recognized, Origin: England, Ireland, USA, Group Mastiff. Grooming: Low, Shedding: Medium, Coat: Smooth, glossy. Color:Any color except for merle. 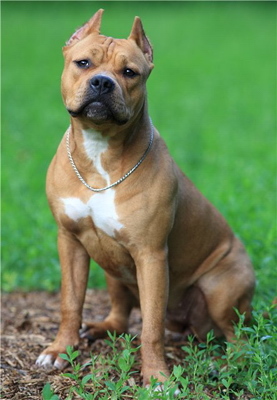 Breed: From the time of the breed formation to the present day American Pit Bull remains versatile, easily trained dog that can easily cope with the pastoral, hunting, guarding and weight-pulling work as well as with the role of the dog-nanny, willing to come into play with the children, guarding and protecting them. The origin of American Pit Bulls is deeply rooted in history. The first references and evidences, that in many parts of continental Europe and Britain, people were breeding and using these dogs, are from about 2300 BC, they were found in the tombs of Abyssinia and Tibet. In the writings of Grazii Falliskus, dated approximately 200 year BC, there is a mentioning of dogs with this type of constitution, brought from Britain, who were stronger and therefore more victorious than the local Roman dog breeds, while acting in the Roman arenas. There are written evidences that between 12 and 18 centuries in England and continental Europe the fights between dogs and bulls (or bears) was a very popular way of entertainment. On the engravings of 15-18 centuries there are pictured some dogs of the same type as the modern American Staffordshire Terriers and Pit Bull Terriers - involved in dog fighting and hunting. Based on existing historical documents, we can conclude that the Pit Bulls had been in America before the War of Liberation (1774). It is known for sure that they were brought by the immigrants from European countries: first of all from Spain, Sicily, England and Holland. The biggest import of Pit Bulls happened immediately after 1845, when a large number of immigrants from Ireland came to America. We can judge the breeding work of those times, by the documents and records of breeders, who suggested that the dogs should be allowed for breeding only in case their properties of nature are corresponding, to two major criteria: the desire to win and friendliness to people. During the centuries of breeding the aggression to people has been removed from Pit Bull character and we now have Pit Bull - a fighter with a boundless will to win and with a very peace-loving character. American breeders made, probably, the best and the largest work, perfecting this breed, but actually, there is no country that can claim the right to be the only home to a Pit Bull Terrier. General Features: American Pit Bull Terrier is recognized from the first sight as a powerful dog, full of passion and strong character. His head is large, with the powerful jaws, but not disproportional. Neck and chest - strong and well built. Eyes rounded, medium size. All colors are acceptable, except for blue. Ears may be cropped or left natural. The tail tapers to a point. 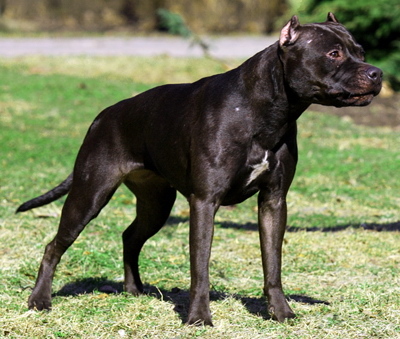 Temperament: Pit Bull Terrier, during the lifetime of the breed, was used not only for fights with animals, but also for protection, hunting and as a shepherd. Modern Pit Bull Terrier is also a versatile dog. A good Pit Bull may not be everything, but it will be still a lot. Properly built dog with a good mentality will show a good result in almost any job. Pit Bull can be trained and is able to achieve high results in almost any direction, because this particular breed of dogs features a high intellect, boundless desire to win and the willingness to reach all the most difficult heights for their masters. Pit Bull Terrier copes well with any destination of his master's choice: a companion, guard, defender, sportsman, hunter, show dog, and just a pet. The main feature of a Pit Bull's character is friendliness. They are affectionate with adults, children and guests. But Pit Bull Terrier will not hesitate to stop any hostile person. One of the integral features of Pit Bull - the ability to distinguish right from wrong. Pit Bull is ready to give his life for the owner at any time. By their nature, Pit Bull Terrier is not inclined to attempt to take a leading position in the family. Pit Bull is independent, but very loyal to his owner, seeking always to bring joy to the owner and to please him. It is a noble, morally and physically strong dog. All these excellent qualities of character are making Pit Bull Terrier a favorite family dog. Pit Bull is an intellectual dog, smiling, with rich facial expressions, very intelligent, communicative and quickly adapting. Modern Pit Bull is a dog for the self-sufficient, confident in their future people. Only a person who knows what he wants from life, can appreciate and understand the high intelligence and genetically accumulated wisdom of this breed, which means he can raise up a decent and socially-adapted dog. The appearance of a Pit Bull in the house often brings his owner to a better - more active and healthy - lifestyle. During the centuries of constant struggle for the victory - even at the expense of his own life - to please the masters, the American Pit Bull Terrier has earned the right to be respected for his past. The right to be accepted in the modern world and the right for a better future! Legendary strength, powerful bite, extraordinary stamina, quickness, extremely well-balanced, soft and gentle character, developed intellect, intelligence, communication skills and a broad smile - that's a Pit Bull Terrier today! Health problems: American Pit Bull Terrier is in general quite healthy breed. There might be some health issues, connected with the dysplasia. Also some Pit Bulls are allergic to grass. Do You Want to Get This Dog Breed for Free ? © VeAnimals. All rights reserved.